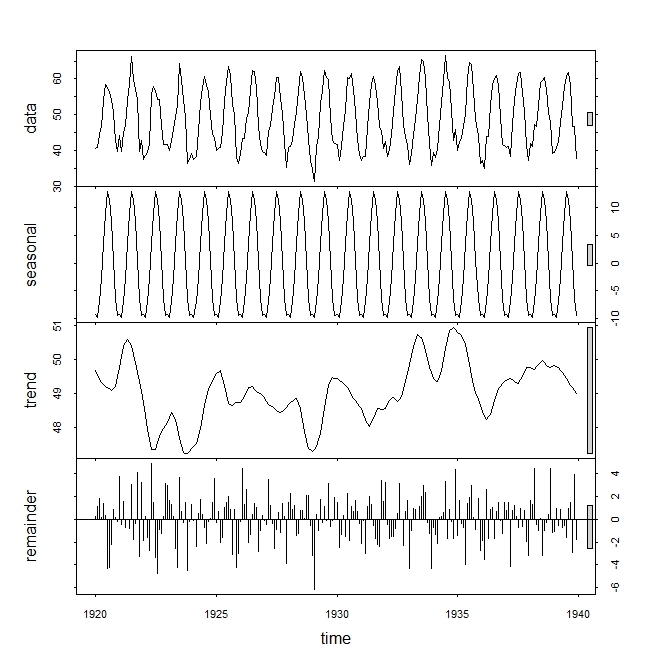 The Seasonal Trend Decomposition using Loess (STL) is an algorithm that was developed to help to divide up a time series into three components namely: the trend, seasonality and remainder. The methodology was presented by Robert Cleveland, William Cleveland, Jean McRae and Irma Terpenning in the Journal of Official Statistics in 1990. The STL is available within R via the stl function. Now that we have the STL decomposition there is a plot function provided for the object created from a call to stl. The four graphs are the original data, seasonal component, trend component and the remainder and this shows the periodic seasonal pattern extracted out from the original data and the trend that moves around between 47 and 51 degrees Fahrenheit. There is a bar at the right hand side of each graph to allow a relative comparison of the magnitudes of each component. For this data the change in trend is less than the variation doing to the monthly variation.